Japanese boffins create scuttling cyber spies Cybernetically enhanced bugs have become a reality meaning that humanity may have more to worry about than the threat of AI-style robots taking over the world. Japanese boffins at Tokyo University are developing a 'robo-roach' remote controlled insect that could be used to carry a miniature camera and microphone. It would not be to make very small documentaries or make its own cockroach karoake either; robo-roach could be used in any number of environments ranging from searching through rubble for disaster victims to acting as a tiny spy in espionage missions. Cockroaches make the ideal agent because they cannot be shot, poisoned or bribed and would be the only life form likely to survive a nuclear war. Working under a $5m grant from the Japanese government, scientists have managed to implant tiny microchip backpacks onto the insects allowing them to be controlled with a remote handset. Only the American cockroach, Perplaneta Americana, can be used in the research because it is the biggest and hardiest of the species, capable of carrying 20 times its own weight. 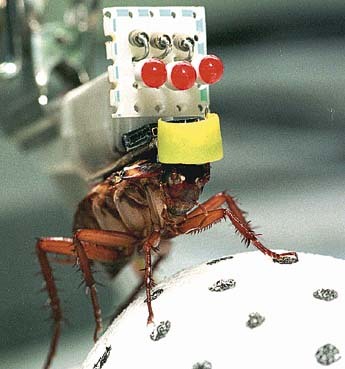 The microchips are implanted surgically after the cockroaches have been anaesthetised with carbon dioxide, and their wings and antennae are removed. The pulse-emitting backpack sends signals to the host cockroach through electrodes, causing it to turn left, right, run forward or back. Apparently there is no 'scuttle under the fridge' function. Although the control technology is accurate to a certain degree, sensitive robo-roaches have been known to leap off the tabletop after receiving a control signal, possibly in a bid to end it all. The development will make industrial espionage difficult to detect as you would be uncertain whether the infestation in the server room was just an innocent attack on your lunch or a cunning bid to find out your passwords. "It will mean that every non-human life form in the server room will have to be exterminated," said one security expert.